Facial can also treat problems like dark patches, treating acne, restoring skin colour and toning the skin. Facials are deep skin treatments that cleanse, rehydrate and rejuvenate the skin, apart from minimizing skin blemishes, acne, dry skin and, of course, wrinkles. .
Facials vary depending on the skin type. Facial is also a vital step towards beautiful skin.Facial thoroughly cleanse your face and remove the top dead layers of the skin resulting into having a beautiful and glowing skin. Facial moisturizers your face effectively and help in faster cell reneval and relaxes the muscle of the face. Facial must be done at least once a month and by a professional beautician. There are many kinds of facials that are suitable for the skin and a particular skin problem. 1. Normal facials are a simple cleanse, steam and massage affair. They’re the least expensive of all facials. They’re also the best option for normal skin that isn’t prone to acne. 2. Special facials are a step-up from the normal facial. Specially formulated hypoallergenic creams are used to moisturize the skin. Face packs are applied depending on different skin types and special cleansing and rejuvenation techniques are also part of the process. 3. Alpha Hydroxy Acid facials-AHA acids, which are derived from fruits and flowers, are known for their anti-aging effects. These facials use creams formulated with AHAs, which help the skin look smoother and healthier. 4. Bio-lift facials these facials include treatment that targets dark circles under the eye. The characteristic of this facial is the bio-mask, which tones and tightens the skin on the face, making it look younger. 5. Paraffin facials are offered as part of bridal beauty packages. It involves the application of a special paraffin mask on the face over layers of gauze, which helps seal in the special anti-aging and rejuvenating creams applied to the skin. 6. Anti-oxidant and pollution-fighting facials uses creams and masks enriched with free-radical fighting agents like vitamin A, beta-carotene and vitamin E. Pollutants are first removed and the skin is then deep cleansed in this procedure. This is recommended for people who have to be outdoors often-on account of their work. 7. Acne Facials should be performed at regular, two-week intervals until problem clears. 8. Collagen Facials type of facial includes use of a multi-phase technique of exfoliation, warm vapor, deep pore cleansing, lymphatic drainage massage and self healing mineral or paraffin masque over a freeze dry collagen sheet to ensure the ideal hydrating effect. 9. 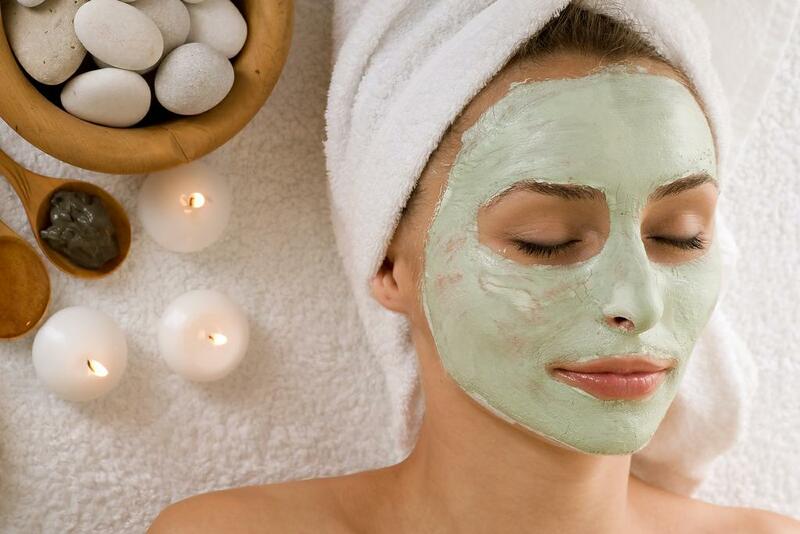 Aromatherapy facials help clear skin congestion and improve the normal functions of the skin. The mask, which is applied at the end of the massage, also contains essential oils. 10. Galvanic Facial-This benefits dry, dehydrated skins, improving moisture retention. It also helps remove congestion. 11. Gold Facial makes use of creams containing 24-Carat pure gold, which penetrates the skin easily. It is a powerful rejuvenating treatment. Gold has a powerful effect on lymphatic drainage, facilitating the removal of toxins and wastes. The gold facial helps to restore youthful qualities, like softness, smoothness, elasticity, resilience and radiance. 12. Men’s Urban Defense Facial -This treatment focuses on softening and rehydrating skin damaged by shaving, sun exposure, and the urban environment. Essential oils of Juniper, Rosemary, and Lavender will relieve any sinus problems. 13. Deep Pore Cleansing Facial has been designed for clients with problematic skin.